Fabio Borini gave Sunderland's survival hopes CPR after a last-minute stunner rescued a point against Crystal Palace. 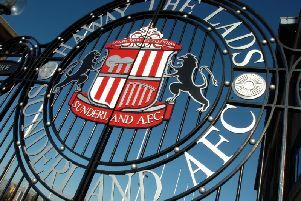 A brace on his Stadium of Light return from Sunderland old boy Connor Wickham looked to have inflicted a defeat which would have had the Black Cats heading towards the Championship. But a magnificent late strike from substitute Borini at least gives Sunderland hope of remaining in the top flight and moves Sam Allardyce's men out of the bottom three for 24 hours at least. In an open game, where Sunderland were on top for an hour, January signing Dame N'Doye gave Allardyce's men a half-time lead with a deflected effort for his first goal in red and white. But after Wickham netted a well-worked equaliser, the ex-Sunderland striker netted a second just six minutes later, and the Black Cats were sinking towards defeat before Borini's late intervention. Jack Rodwell - included in the starting XI at the expense of Lee Cattermole - produced Sunderland's first meaningful effort in the 12th minute when he unleashed a right-footed drive from 25 yards, which was relatively comfortable for Wayne Hennessey low to his left. At the other end, Vito Mannone had to be quickly off his line to block at the feet of Damien Delaney after Sunderland struggled to deal with Yohan Cabaye's inswinging free-kick. And then Wahbi Khazri saw a low angled drive from the edge of the box deflected inches wide of the far post, with Hennessey stranded. The game remained very open, with Jordon Mutch firing into the side netting in the 22nd minute after overlapping Yannick Bolasie down the left-hand side of the area. On the half-hour mark, Mannone produced a magnificent save to keep Sunderland level after Scott Dann met Cabaye's left wing corner with a diving header. Dann's effort looked destined to find the net, but Mannone tipped it over the bar high to his left. The opener arrived for Sunderland six minutes later after N'Doye benefited from a slice of fortune. Jermain Defoe laid it off for the on-loan Trabzonspor striker 25 yards out and he hit a low shot which took a wicked deflection off Palace defender Scott Dann and left Hennessey completely wrong-footed. Sunderland had coped comfortably with Palace's attempts to find an equaliser in the early stage of the second half, but in the 61st minute, the visitors pulled level. Zaha produced a mazy run inside off the right and fed Bolasie on the edge of the area. Bolasie played a reverse pass to Wickham, to the left of goal, just inside the box, who struck a powerful right-foot shot which crashed into the net off the far post. Wickham then doubled his tally six minutes later after profiting from some awful defending from a Cabye corner. Sunderland didn't deal with the ball as Dann and Damien Delaney challenged for it and dropped down to Wickham four yards out, who smashed a volley beyond Mannone. Allardyce's men were completely shell-shocked after the turnaround, as they struggled to regain their composure or maintain possession. But in the last minute, they got a lifeline when Borini received the ball in what appeared to be an impossible angle down the right-hand side of the area. Borini let fly with an unstoppable right-footed drive which rocketed into the far corner.